Great recipe!! I have some guest coming over. I will be trying this recipe for them. Thanks. I hope the recipe works out well for you. Please let me know how you and your guests like it. Thank you for leaving a comment. I just love your recipes Geetha, and this is the first time I have actually visited your site, even though I have seem some of your recipes. I am here today to look for Kheer made with Sevian. I am a newcomer to Indian food, but a big fan, and at home in Cairo, Egypt, I cook many Indian meals. I love original authentic recipes, and the way you make it all seem so easy! This is my first visit to your site Geetha. I love original recipes, and had heard about this site from many friends. 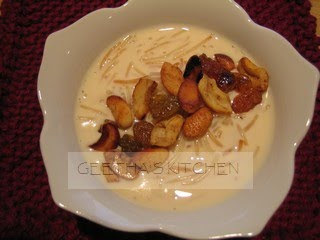 I visited today as I was looking for this Kheer recipe. I love vermicelli pudding and shall be trying this today. I am a newcomer to Indian foods, and a big fan, and I love to cook simple but authentic Indian food at home in Cairo Egypt. This was an extremely easy recipe! I followed it step by step and it turned out perfect! Was a great hit for Karthi, which we celebrated here in New York :) Thanks, and keep the awesome recipes coming. Hello Priya, I am so glad that the recipe worked for you. And, thank you for the compliments, you just made my day! :) Happy Karthikai!